To watch and interact at this pureMix.live event, you'll need to be a pureMix Pro Member. If you're already a pureMix Pro Member, please login and you'll automatically see the private live stream video player. If you're not already a pureMix Pro Member, sign up today to see this exclusive live stream event and also EVERY pureMix tutorial video and mixing contest! In our recent video: "Principles Of Mix Bus Processing", Fab broke down the steps to building a 2 Bus Chain that can provide tone, vibe, and efficiency when sculpting your mix. Mix Bus Processing is a widely discussed topic and there are a ton of different ways to approach it. Ask questions and get answers. 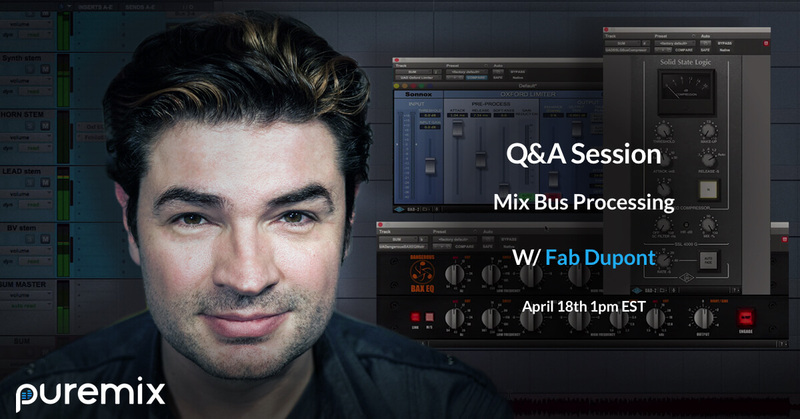 In this Pro Member Exclusive Q&A session, Fab Dupont will answer YOUR questions about using 2 bus processing, as well as demonstrate how he approaches it on each mix. Submit your questions here or come with your questions in hand this Thursday, April 18th at 1 pm EST.